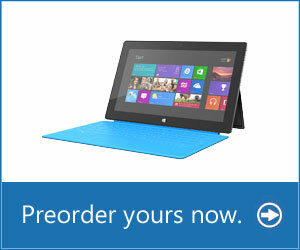 Today Microsoft announced that their Microsoft Surface tablet with Surface RT is now available for pre-order. This tablet can be purchased from http://www.Surface.com and will be released on October 26. Pricing for this tablet starts at $499 for a 32 GB model, $599 for a 32 GB model with a Touch Cover, and $699 for a 64 GB model with Touch Cover. The Touch Cover is a dual-purpose pressure-sensitive external keyboard and protective cover, and it's available in five different colors (Cyan, White, Magenta, Black, and Red). If you like mechanical keyboards there's a Type Cover available as well. Apps (included) - Mail • Messaging • Word • Power Point • Excel • OneNote • SkyDrive • Internet Explorer 10 • Bing • Music • Video • Games • and more. If you do plan on pre-ordering a Microsoft Surface tablet, you should know that there are two versions: Windows RT and Windows 8 Pro. The Surface with Windows 8 Pro will offer the full Windows 8 experience, while Windows RT will not. If you want to be able to run desktop applications like iTunes or Google Chrome you'll need to wait for the Surface with Windows 8 Pro to be released, but if you only plan on using tablet apps then Surface RT is good enough.